Millions in the world today need to be reminded that they are loved. That they are not forgotten. That someone does care. Over the years, Lambs of Love have made their way into foster homes, hospitals, hospice care facilities, and to orphans in Uganda. Each Lamb is named, love on, and prayed over (many by children themselves) then distributed to those in need. Every Lamb is delivered believing that the miracle-working power of love will bring great miracles in the lives of those receiving them. Love works. Lambs of Love make their way to orphans in Uganda. When you give love, hope is restored, possibility reborn, and dreams are given a chance to live again. Millions in the world today need to be reminded that they are loved, that they are not forgotten and that someone does care. Over the years, Lambs of Love has become that reminder. 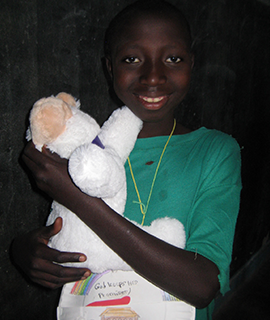 Lambs of Love have made their way into foster homes, hospitals, hospice care facilities, and to orphans in Uganda. Each Lamb is given a name, loved on, prayed over (many by children themselves) then distributed to those in need. Every Lamb is delivered believing that the miracle-working power of love will bring great miracles in the lives of those receiving them. Lambs of Love bring comfort to the sick. Millions in the world today need to be reminded that they are loved. That they are not forgotten. That someone does care. Over the years, Lambs of Love have made their way into foster homes, hospitals, hospice care facilities, and to orphans in Uganda. Each Lamb is named, love on, and prayed over (many by children themselves) then distributed to those in need. Every Lamb is delivered believing that the miracle-working power of love will bring great miracles in the lives of those receiving them. Click the Sponsor button below to begin. Lambs of Love brings hope to this in need. To become a Lambs of Love sponsor, select your sponsorship level below, complete the giving information that follows, and your lamb(s) will be rushed to those in need. If you would like to give your lamb(s) a special name, or include a special word of encouragement with your gift, simply email your request. If you would like to speak with someone personally about your sponsorship, please included your phone contact in your email. Thank you for sharing the gift of love. Love works.